1. Veggies. It might surprise you that this is an excellent time of year to start a vegetable garden. Don’t wait until the May 24 weekend to get started. By then you will have missed the best time to sow many of your favourite crops including: peas, carrots, onions, lettuce, broccoli, cabbage, Brussels sprouts and garlic (though fall is better for garlic). This is a great time of year to prep the soil of your garden by spreading 3 to 4 cm of composted manure (or reliably high-quality compost). You can turn this under the soil or plant right in it. 2. S tart from seed indoors. Sow tomatoes, cucumbers, leeks, zinnias, asters and the like now. With 5 to 6 weeks until our last frost date, your timing will be perfect. Come late May/early June, you will be ready to plant in warm soil and your transplants will take off. You will save a small fortune too, as you won’t buy transplants at your garden retailer. 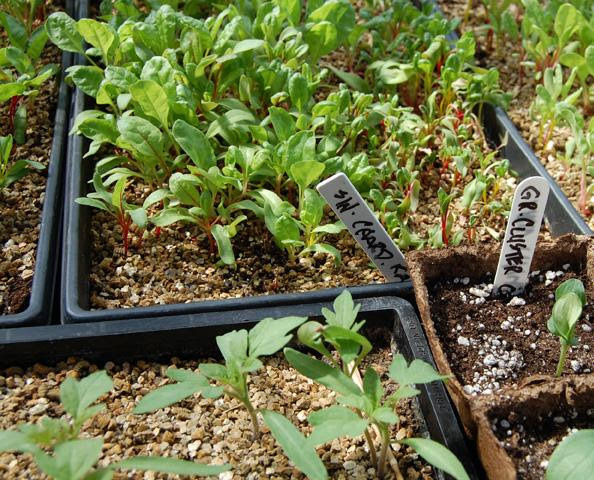 Use a quality seed starting mix — All seedlings need plenty of light to grow properly: sunlight or fluorescent lights work best. Rake with a fan rake to remove winter debris. b. Fertilize with Golfgreen Iron Plus. It is the best product of its kind on the market. Chelated iron for a fast green-up. Slow release nitrogen for a long lasting green. 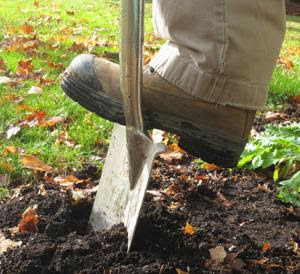 c. Where weeds occur or thin spots exist, spread lawn soil 4 cm thick and rake smooth. Broadcast quality grass seed at the rate of one kg per 100 sq. meters. Rake this smooth (again), step on it with flat soled shoes and water until germination. Keep reasonably well watered until new roots are established (about 4 to 6 weeks). d. When you are ready to cut your lawn, set your mower at 6 to 8 cm high. Any lower allows weeds to establish and weakens your lawn. Use a mulching mower. 4. Plant trees, shrubs, evergreens and roses. All of the ‘winter hardy’ stock that you find at garden retailers this time of year can be planted in the garden, unless it has already flushed new, soft growth: an indication that it was forced in a greenhouse and is now frost-tender. All woody plants that are dormant at the time you purchase them are ready to plant this weekend. 5. Dig and divide. This is a great time of year to dig up perennials and divide them into sections to replant around your yard or give away to friends and neighbours. Hosta, monarda, daylilies: you name it. 6. Soil prep. Note that ‘quality’ soil is the key. Don’t use ‘black earth’ (basically peat-muck) or cheap manures which are often not manure at all. Producers have been known to cut corners in production to keep costs low. The results are never good. Quality soil and compost is alive with nutrients, is safe (teeming with beneficial bacteria) and is high octane fuel for everything that grows. Look for composted manure that is certified by the Compost Quality Alliance. I spread 4 cm of well-composted manure over my entire garden each spring. Yes, I use over 40 yards of the stuff. And finally, after you have returned your garden furniture to its summertime place, be sure to sit on it. Enjoy the bird song (put out feeders and nesting boxes), the wind and the sunshine. It may not have been the longest, coldest winter on record but you have none the less earned a break from the indoors. This entry was posted in Flowers, Lawn & Garden Care, Lawn Care, Uncategorized, Vegetable Gardens and tagged black earth, cattle manure, composted manure, dig & divide perennials, garden to-do list; starting veggie seeds; start vegetable seeds indoors, Golfgreen Iron Plus, lawn care for spring, lawn preparations for spring, Mark Cullen's May Garden To-Do List, mowing height for lawn, organic compost, organic composted manure, organic manure, overseeding lawn, planting evergreens and roses, planting trees & shrubs in spring, preparing your soil for vegetable garden, sheep manure, soil amendments, soil prep for gardens, start from seed indoors, topdressing your lawn with seed, vegetables to plant in early May. Bookmark the permalink.